What is a bi-fold door threshold? The threshold of your door is the bottom track along which the door slides to open and close. It can either be sunk into the floor so it is flush or can sit just a little above it at around 15mm. What threshold options are available? The Origin Bi-Fold Door is available with either a weathered threshold for total weather protection or a non-weathered threshold. Thresholds are configured slightly differently depending on whether the doors open in or out. What is the difference between a weathered threshold and a non-weathered threshold? A weathered threshold provides much better protection against the elements than a non-weathered threshold but often requires a small step between the indoors and outdoors. A weathered threshold can be installed with concealed drainage or face drainage to channel rainwater away from the door. The weathered threshold can be sunk so that the upstand is just 15mm from outside to in. Non-weathered thresholds are flush with the floor, meaning there is no difference in height between the inside floor and the ground outside. This suits households with older people, toddlers or people with mobility issues. Building regulations state that a threshold of 15mm or under is considered wheelchair safe, so a weathered threshold may still suit a household with wheelchair users. However, a non-weathered threshold might not offer protection against bad weather; in fact, most manufactures do not guarantee weather protection when a non-weathered threshold is installed. You may suffer from water coming through the doors, which could create a small puddle, or wind and air entering the home. This type of track is ideal for internal use or if the door will open out onto a sheltered outside area. Why do you need drainage with bi-fold doors? 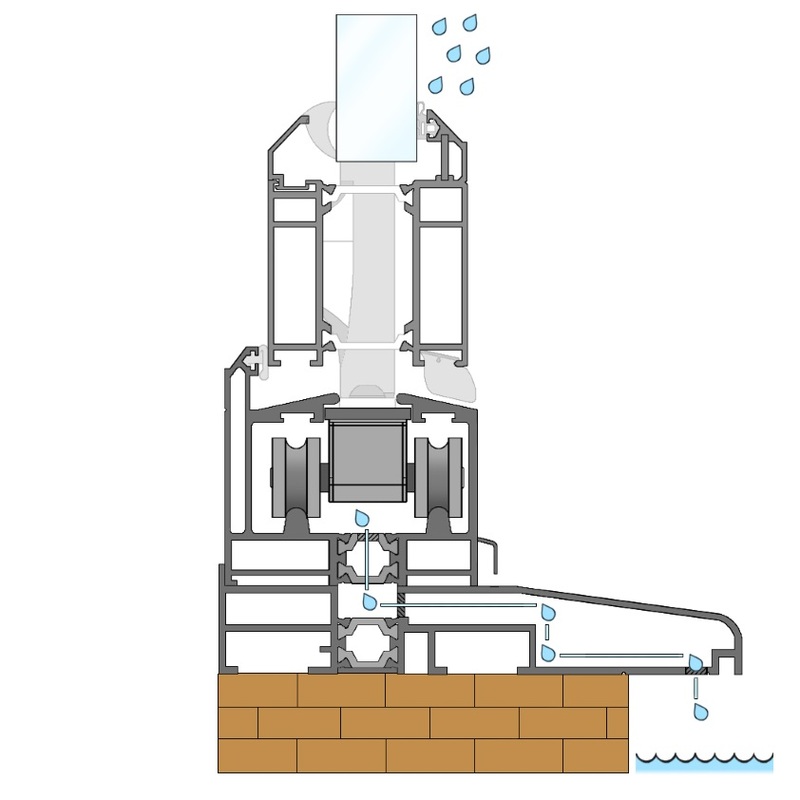 A drainage system installed within the threshold prevents water pooling in the track, which can compromise performance in the long run. There are two types of drainage available: face drainage and concealed drainage. Water enters the lower chamber of the track and exits via a capped hole in the outer face. It is commonplace to then put a drain in front of the door track so the water can be routed to a drain. Water exits the bottom track through the polyamide break barrier and enters the top of the cill. From there, it travels through the front section of the cill and out of the very front edge underneath. A weathered threshold will prevent any leakage. The lip of the threshold creates a seal against the door which stops any water getting in. Water tightness is measured in pascals. 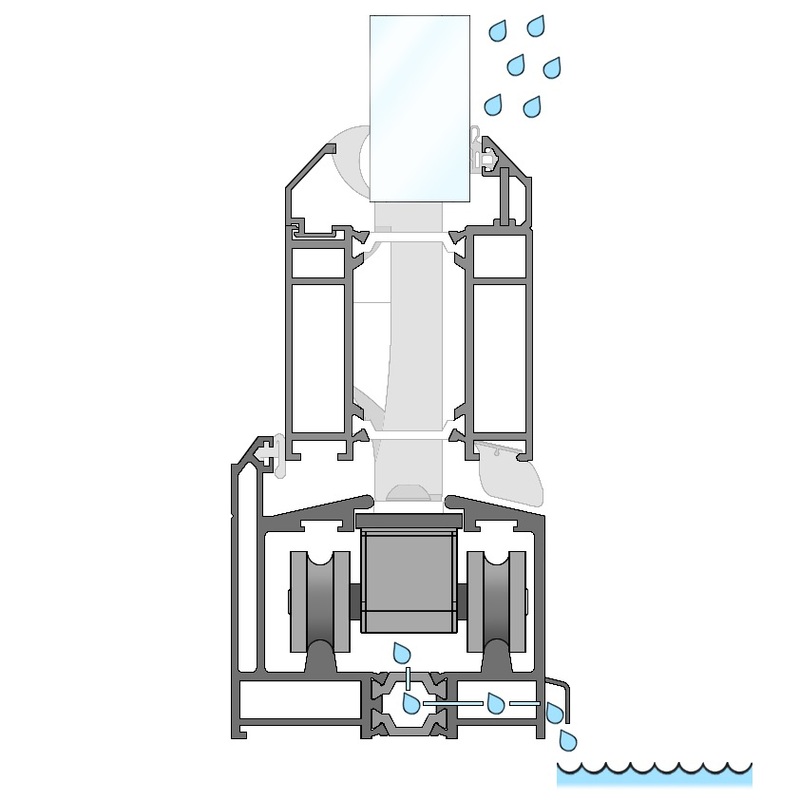 During water tightness tests, the Origin Bi-Fold Door has been proven to withstand pressures of up to 600 pascals, meaning it can resist the harshest weather conditions. The Origin bi-fold door has also passed Florida’s High Velocity Hurricane Zone testing, meaning it can withstand extreme weather. What is a bi-fold door threshold connector? If you extend the side of your bi-fold door you will need to install a threshold connector. This is simply a small piece of material that connects two sections of the threshold. If I choose a flush door, will it still be weatherproof? Yes, a flush door will still be weatherproof to an extent, but it won’t offer maximum protection and we cannot guarantee it will protect you from water, wind or air. Normally we would only recommend a non-weathered threshold for interior bi-fold doors and always recommend a weathered threshold for exterior doors. Weathered thresholds can be installed to be as low as a non-weathered threshold hold, though this does require planning during the design process. If you would like your threshold to sit as low as possible you will need to discuss this with your installers or architect to ensure you can combine your wishes with the best draining system for the location of the doors. Weathered thresholds are still low and rarely compromise the overall aesthetic of the doors. Many people often decide to choose the practical option over the aesthetic option in order to fully protect their homes from the elements.